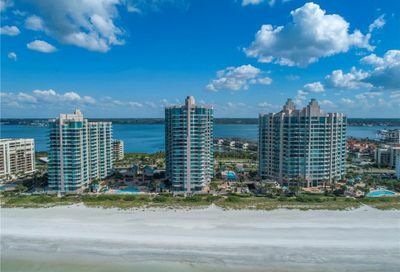 Ultimar provides the ultimate in luxury Gulf-front living on the beautiful island of Sand Key in Clearwater Beach, Florida. Built in the early 1990s, the three towers of Ultimar deliver all the marvels of modern construction and the latest technology. With fine details and extras galore, condo interiors feature hardwood floors, porcelain tiles, gourmet kitchens, and oversized master suites with garden tubs and dual walk-in closets. Most Ultimar homes have two bedrooms, and a few include three bedrooms with about 2,500 sq. ft. of living space. Wraparound balconies offer private panoramic views of the Gulf of Mexico and its famous sunsets. The Ultimar community features every amenity imaginable, such as gated entry, 24-hour security, private garages, three heated swimming pools with spas, tennis courts, a putting green, croquet lawn, basketball court, fitness center, spa, conference room, billiards room, game room, club room and water access. Clearwater Beach is minutes away, with all its shops, dining and entertainment venues. If you are in search of a sophisticated waterfront lifestyle in the perfect location, you have found it at the premier condominium homes of Ultimar.